America’s favorite game and its greatest invention are more connected than you’d think. Americans learned to play football at about the same time they learned to fly airplanes, and it was no simple coincidence. “Air-mindedness” at the turn of the 20th century meant reaching further and climbing higher, and in their shared focus on aerial heroics and militarism, America’s favorite game and greatest invention grew up together. True, football has always been a hard-hitting ground game. But even at its inception in the 1870s, it toyed with aerial terminology. Games included wing formations and wingmen, along with the “flying wedge,” a triangular formation of linemen protecting the ball carrier with a punishing phalanx, which made its debut at the Harvard-Yale game on November 19, 1892. Famed coach Glenn “Pop” Warner spoke about teams as armies, coaching as generalship, seasons as campaigns, games as battles, plays as attacks. As injuries and deaths on the field mounted, patrons found ways to make the game safer, including a new aerial component: the “forward pass,” meant to discourage mass play and advance the “revolution of the ball on its axis,” as Fielding Yost put it. Football was becoming more like science and engineering. One of the first forward passes happened on November 24, 1906, when the Yale quarterback launched a 30-yard pass to set up a touchdown run, for a “spectacular victory” against Harvard. This was just two years before the Wright brothers went public with their invention, as Wilbur flew at the Le Mans racetrack before astonished French crowds, and Orville flew over Fort Myer, Virginia, in a bid to sell his plane to the U.S. Army. The key to both the forward pass and the Wright Flyer was control, and both innovations took place in the American Midwest—the airplane in Dayton, Ohio, and football’s passing game at places like Wisconsin and Chicago, Purdue and Notre Dame. Knute Rockne of the Fighting Irish astonished crowds with long, running catches, and the forward pass soon became “the most popular feature” of the game, as Percy Haughton had it. Like football, flying was a spectator sport, and newspapers relegated both pastimes to the sports pages. Pilots raced airplanes the way they raced cars, often at the same venues, like the Indianapolis speedway. With the formation of the National Football League (NFL) after 1920, America’s cities formed competitive teams that drew recruits from the best college programs. Like stunt fliers, these teams sometimes “barnstormed,” travelling from city to city. And like the new Air Mail pilots, footballers slogged on in all kinds of weather. Football heroes and hero pilots became commodities all their own, as with superstar Red Grange, whose image sold candy bars and soap, and Charles Lindbergh, whose name sold just about anything. Before long aviation began to develop more direct ties to the game. In 1916, a squadron called “The Football Special” flew spectators from New York to New Jersey for the Yale-Princeton game. Airplanes dropped leaflets on stadium crowds and advertised with streaming banners far over their heads. After 1955, the Goodyear blimp took to the skies over the Rose and Orange Bowls, and in 1958, at the cusp of the jet age, prestigious colleges like UCLA and Stanford even proposed an “Airplane Conference” to attract profitable television coverage. Sometimes team flights brought tragic results, as with the crashes of the Wichita State and Marshall University teams. As airplanes became more aerodynamic, so did the football. As early as the 1930s, the once-rounded ball took a more tapered shape for the long spiral passes that energized the game. In this art-deco moment, football and aviation shared the same new graphic sensibility, of curving bodies and helmets, planes and dirigibles, arcing through space. Football became such a central part of America’s masculine culture that soldiers adapted its terms for aviation, and vice versa. General Hap Arnold of the U.S. Army Air Corps co-wrote This Flying Game (1938), comparing military aviation to a football game that required commands and routines, with close formations and precision landings. Claire Chennault and his Flying Tigers in the Asian theater of World War II even trained as a football team, using their scrimmages as practice sessions for coming missions. The Army measured the lead times needed for its helicopters and fixed-wing craft to maneuver and fire by the length of a football field. Football metaphors were unavoidable in a country at war. The crews of B-17 bombers nicknamed the targeting instrument on the Norden bombsight “the football,” and hoped for a perfect throw. Lt. Tom Harmon, who won the Heisman Trophy in 1940 for his quarterbacking and halfbacking at Michigan, had a mascot painted on his B-25 bomber: a football bulldog wearing his #98, now throwing a bomb instead of a football. During the Korean war, Air Force generals argued about “going deep” to bomb strategic North Korean transport and industrial targets above the 38th parallel. The Linebacker raids (1968-1972), with escalation bombings from America’s premier B-52 Stratofortress, sought to defend South Vietnam from North Vietnamese and Viet Cong offensives, much as a linebacker might prevent runs in a football game. The U.S. Navy was perhaps the most creative service in its adoption of football ideology. Unlike the Army and Air Corps, its academy and training programs continued to play football during World War II. Commander Thomas Hamilton, former coach at the Naval Academy, helped to write one of a series of Naval Aviation Physical Training Manuals for football, like the one that taught “Hand-to-Hand Combat.” As it proclaimed: “Football! Navy! War! At no time in history have these words been more entwined and intermeshed than they are now.” The manual compared the best qualities of the footballer and aviator: “aggressiveness (physical and mental), physical fitness, coordination, alertness, discipline, teamwork, and toughness.” Pre-flight squadron football teams took on the names of the Navy’s own warplanes: Wildcats and Mustangs, Buccaneers and Mariners, Devastators and Helldivers. As football had once been a proxy for war, now it became a training ground for it. Navy wartime football gave some of its achievements back to the sport. Alumni included quarterback Otto Graham, future star of the Cleveland Browns; and assistant coaches, Paul “Bear” Bryant and Woody Hayes, future coaches of the Alabama Crimson Tide and Ohio State Buckeyes. Lt. Don Faurot, head coach of the Navy’s Missouri Tigers, gave football the “split-T” formation, precursor of the “spread offense,” in order to loosen the line for quick run or pass plays. Navy football also contributed directly to military tactics, as in the case of Jimmy Thach and his famous “weave” formation. Sitting at his kitchen table in San Diego, and drawing from his football career in high school and at the Naval Academy, he used matchsticks to create a flying formation and series of moves for his vulnerable Grumman Wildcats. It helped them defend and attack against the Japanese Mitsubishi Zero fighter, which was more able at climbing and maneuvering. Thach and the Navy soon used it with success at the Battle of Midway in June 1942. Here was a football formation not for the gridiron but for aerial warfare. By the 1960s, football began a slow rise to replace baseball as the country’s favorite pastime. Quarterbacks mastered the “bomb,” the long pass for a touchdown, and deep-passing quarterbacks became the rule in college and professional programs. By the 21st century, cable-suspended cameras, with high angle views from above the field, captured all of this for television audiences. 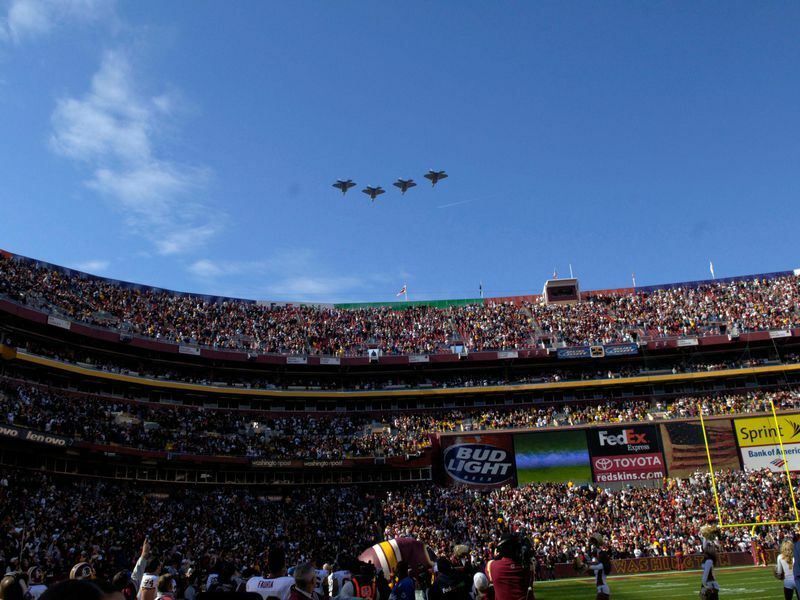 With the terrorist attacks of September 11, 2001, the Super Bowl became a “National Security Special Event,” worthy of aerial protection, as when the North American Aerospace Defense Command (NORAD) enveloped Super Bowl XLII with U-28A surveillance aircraft, Blackhawk helicopters, and more F-16s. As football and flying embark on a new century of achievements, there’s an increased emphasis on safety. Just as commercial airlines have worked to fly more safely, the NFL has paid increasing attention to the risks of head-on hits and injuries. To survive another century, it may need to become even more of an aerial game than it’s been in the past. Michael G. Smith is a Historian at Purdue University and the author of Rockets and Revolution: A Cultural History of Early Spaceflight.